Blueprint For How To Make Money With A Blog by Peter Anderson from Bible Money Matters is a quality package for people who are starting out blogging and are interested in monetizing their work. It does a good job of of giving the step by step of what you need to consider when starting a blog that you hope to make money with, and then how to actually make money. It is especially good if you are just starting out blogging. Peter does a good job of covering all the bases that you need to make money with your blog. Starting from choosing the right platform, to picking a good host, and on to the different ways to make money. I particularly like the parts where he went over his story. He shared the mistakes he made with his blog and how he would do it if he could start over. These were some of my favorite sections. There is a nice section in the middle of the book on the most important part of a blog: The Content. Content is king, and promotion is close behind. You have to create good content and lots of it. Then you have to let other people know about it. The book dedicates 5 chapters to this key to success and provides many good tips. The last section is all about making money. He gives you an idea of how long it takes to start making money, or at least how long it took for him. He also goes over the many different methods of making money including adsense, affiliate networks, banner advertising, and creating products. He also focuses a chapter on optimizing your ads for the best performance. *crickets* I thought that overall the book was really good, though it was mostly review for me. I have been blogging for about a year and a half so I have been through much of the information presented in the book. It was a great review for me though and reminded me of many things that I haven’t been doing lately. If you are a beginner though, this is a great resource. If you are a beginner, or maybe haven’t even set up your blog yet, this is a great book that will save you time getting started. If you have been blogging for 2 years and have already made some money from blogging, there probably isn’t that much new for you. If you are set up but haven’t actually made any money yet, this could be a help to you for sure. The limited time bonus ebook containing advice from many successful bloggers was also very interesting read. It was one of my favorite parts of the package. Getting different perspectives and tips from a bunch of people who have actually succeeded at making money from blogging is pretty valuable. It really lets you know what it takes, as well as letting you know what is important and what is not. 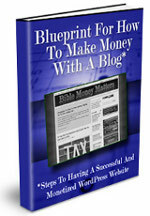 If your interested you can check out Pete’s Blueprint For How To Make Money With A Blog at his site. Thanks for the review! For advanced bloggers the resource may have a lot of review in it, but I think the ebook is more focused towards those who are beginners or intermediates, focusing on the things I did to become successful with my blog. I hope it can be a helpful resource that can help others to get started down the right path to monetizing their blogs. Thanks again! No problem. Thanks for the great resource. I suspect a lot of people could save a bunch of time at the beginning of their blogging careers. I should of printed it when it was free. was free for a period of time.